If you follow me on Instagram, this outfit will look familiar. I had my hubs take a iPhone pic of this comfy Saturday look for a quick IG moment. I wasn't even thinking about putting it on the blog. I do this a lot actually. I don't know why I let IG sometimes steal what could be some really good blog posts! It's something about that "instant share" that's hard to resist! 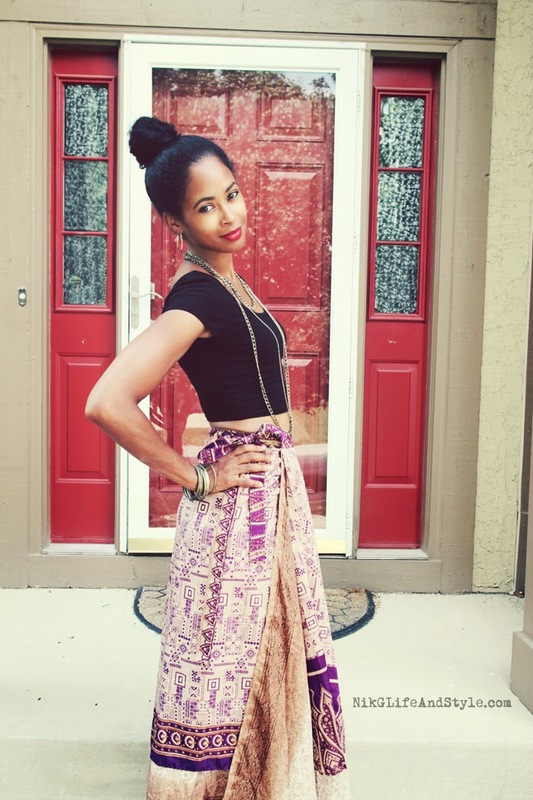 So I'm wearing a crop top with a silk Indian wrap skirt. I buy these skirts off of eBay because they are pretty cheap and so comfortable. The fact that they make me feel like a Bollywood princess doesn't hurt either. 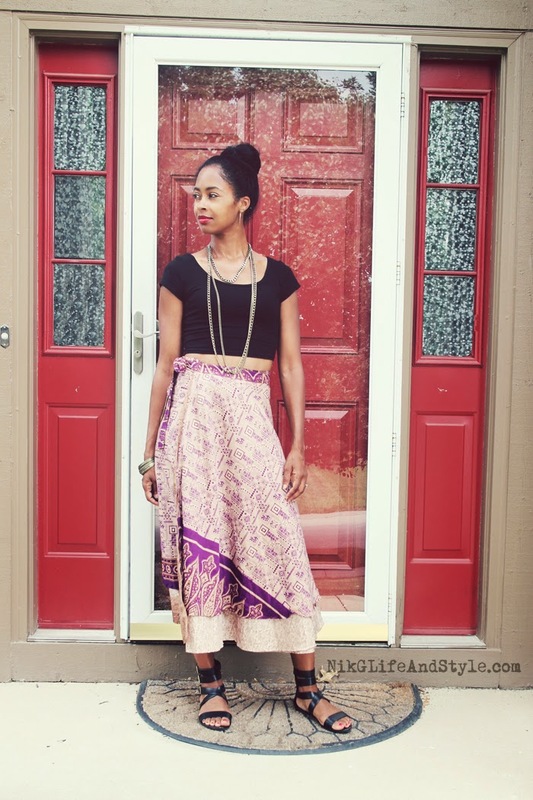 I won't link you to a specific eBay seller, but if you're interested in these skirts, just search "Indian wrap skirt" on eBay and a bunch of them will pop up from numerous sellers. This particular one, I got from a seller who sends them from Israel! These skirts are perfect during the summer, and transition really well into the colder months. In the summer, as you can see, they look great with tanks, crop tops and cute gladiator-style sandals. In the fall/winter, I pair them with tights, ankle boots, with a chunky sweater to top it off. I've also bought skirts like this off of Amazon. They actually have a really nice selection. Buying from them should give you peace of mind in knowing that if you buy them using prime shipping or showing as being "fulfilled by Amazon", you have the ability to return the merchandise if you're not happy with it. That usually isn't the case with eBay, FYI. I've linked you to a few below. Thanks! So easy to wear and at a great price! But wouldn't they also make the perf "strapless sun dress"? And I screamed "So fkn Indie, I love it!" when I saw you post this on IG. You're too gorgeous woman! Love, love this! Makes me want to get out a few of my clothing similar to this. I haven't done this in forever! YES!!! you look beautiful! The high bun just sealed the deal! LOVE! Wonderful look! You're so pretty! Love the skirt so much. umm you look AMAZING! Love the print on that skirt!